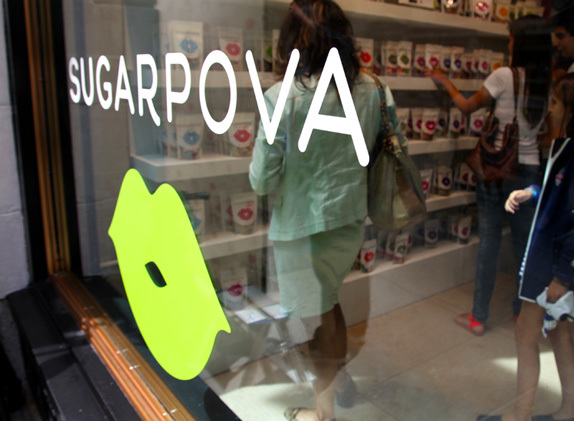 Launched last week, Sugarpova is a new line of twelve premium gummy candies in different, self-described “fun, unexpected” types and shapes imagined and “sold” by tennis superstar Maria Sharapova — hence, the product’s name — who is not just one of the great women tennis players of our time winning 27 WTA singles titles that include four Grand Slam singles titles but, at 25 years old, she is also a very astute business person, ranking 26 in Forbes’ World’s Highest Paid Athletes list that shows that $22 million of her total $27.9M earnings to date come from endorsements. 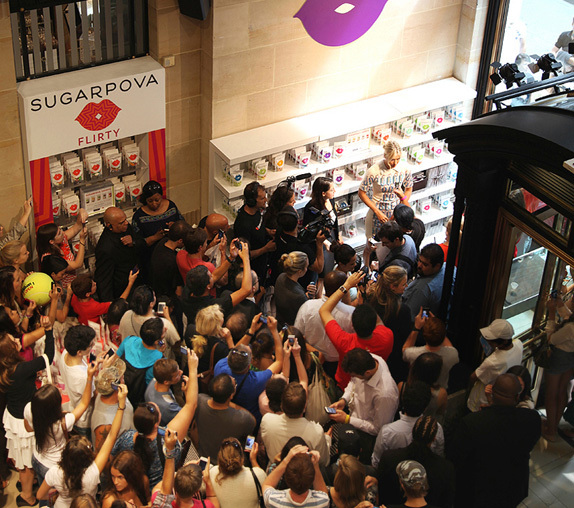 Sugarpova will be sold at fashion store Henri Bendel in New York, available at hotel minibars, and at their own website. The new logo and packaging was designed by Brooklyn, NY-based Red Antler. Sugarpova brings a new level of sophistication and quality to the gummy candy market, without losing sight of the playful nature of the product. The brand needed to communicate this balance by being fashionable, fresh and fun, just like Maria. We designed a unique lip shape that can be altered to convey the many attitudes of the brand — chic, cheeky, silly, sassy, flirty, quirky, spooky, and smitten — corresponding with different shapes and flavors of the gummies themselves. It’s hard not to like this identity and packaging in the same way that it’s hard not to like gummy candy. It’s fun and vibrant and colorful. And everything about it matches in personality and attitude: from the pun-y name of the product to the shapes of the gummies to their names to the faces and dresses worn by Sharapova in promoting it. None of it is my own personal flavor and I am far from the intended audience but I can see a product and brand on target when I see one. Technically, everything is pretty well done too. The icon is catchy and graphic without turning too cartoon-y and the typography is playful and sophisticated with only one minor flair in the elongated “R” to give it some distinction. The patterns in the lips are the one element that I feel could have been executed better or, if not better, at least more interestingly — there is very little separating the wave pattern of “Splashy” from what you would see on a billboard for an middle-of-nowhere water amusement park. Overall, it’s a strong debut for what is otherwise overpriced candy — although I have to admit, I’m curious about those tennis ball gummies. At the launch on Henri Bendel in New York. 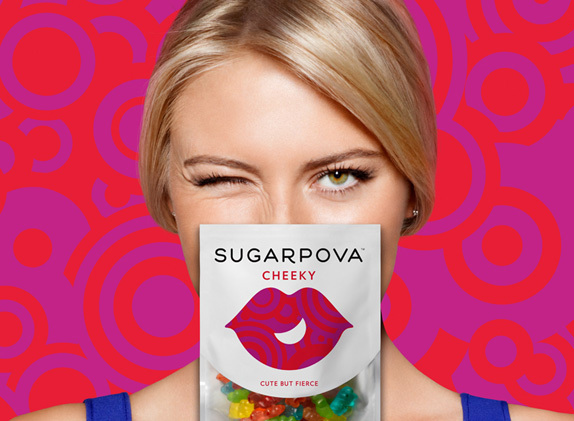 Launched last week, Sugarpova is a new line of twelve premium gummy candies in different, self-described \"fun, unexpected\" types and shapes imagined and \"sold\" by tennis superstar Maria Sharapova — hence, the product's name — who is not just one of the great women tennis players of our time winning 27 WTA singles titles that include four Grand Slam singles titles but, at 25 years old, she is also a very astute business person, ranking 26 in Forbes' World's Highest Paid Athletes list that shows that \$22 million of her total \$27.9M earnings to date come from endorsements. Sugarpova will be sold at fashion store Henri Bendel in New York, available at hotel minibars, and at their own website. The new logo and packaging was designed by Brooklyn, NY-based Red Antler.